The day after we went to Disneyland, we went to California Adventure. I was looking forward to this because I knew it would be less crowded and had rides for Isla that aren't "scary". After the long day we had the day before, all the adults seemed to be dragging a bit, but we rallied. 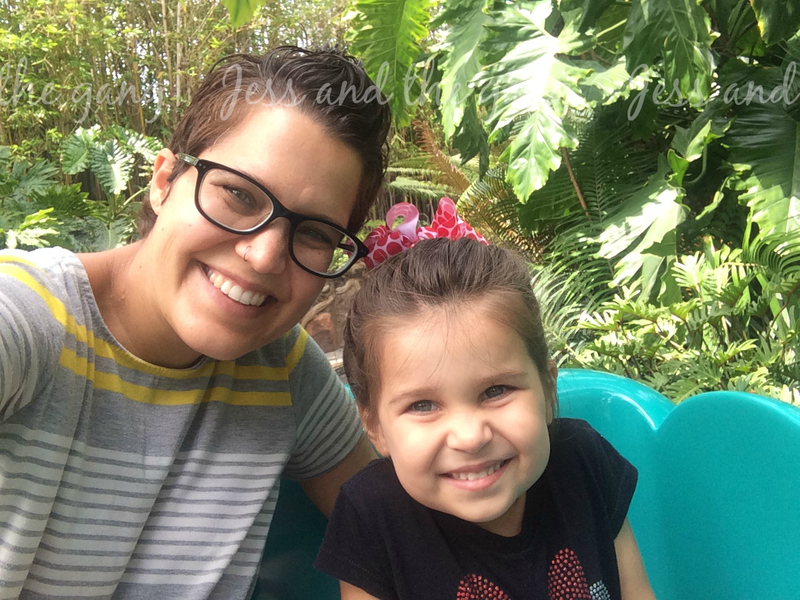 Isla and I spent a lot of time in A Bug's Land because both Isla and I could ride all the rides. So, when others wanted to ride other things, I would take her there. Her and I also went on the ferris wheel twice and a merry go round. She said her favorite ride that day was the ferris wheel. Connor is now tall enough to go on a lot of the rides. 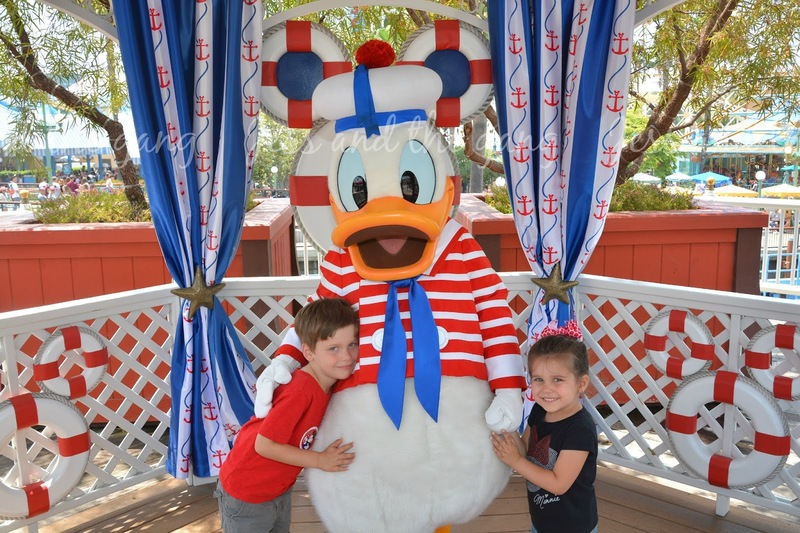 His favorite ride that day was Goofy's Sky School, which is a roller coaster for kids. Really, the highlight of the day for me was the princess lunch at Ariel's Grotto. Both kids were excited about it. 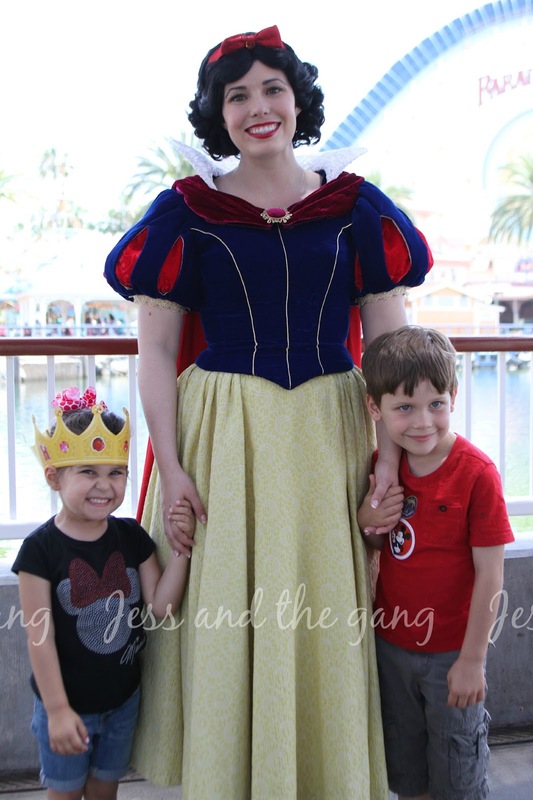 Though, Isla was much more excited about meeting the princesses than Connor was. 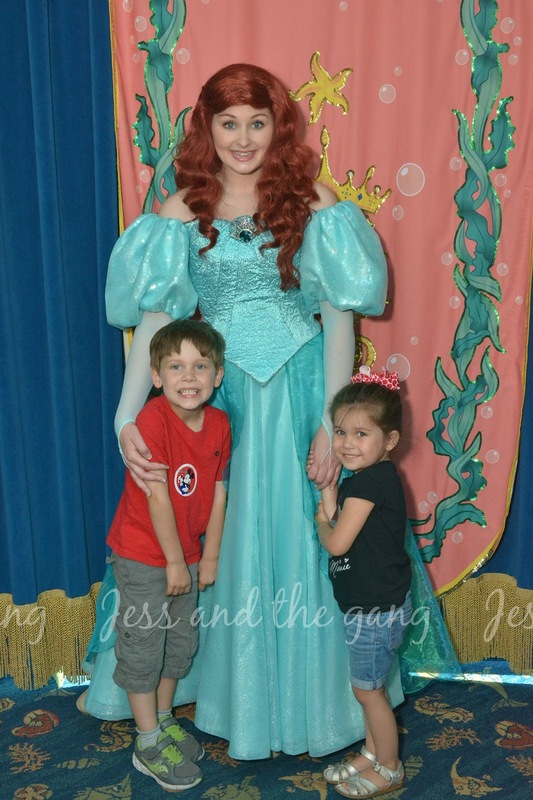 They got to meet Ariel coming into the restaurant. It was a beautiful setting, sitting on the water for lunch. A page came out, walked around the restaurant singing. Then, he came out four different times announcing the various princesses - Snow White, Belle, Tiana and Cinderella. 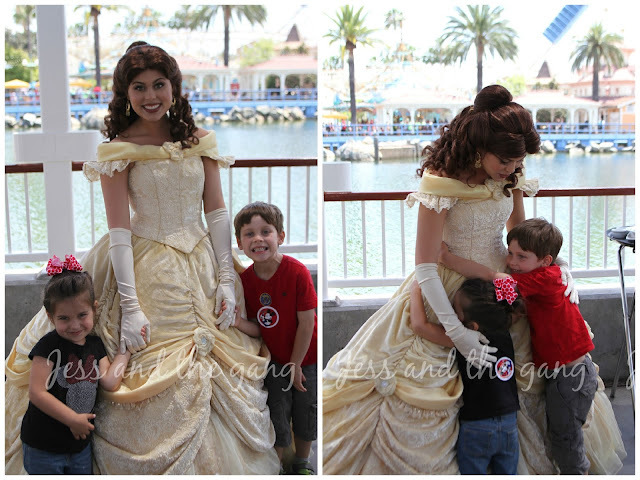 Isla was so excited and could hardly wait for the princesses to get around to her. They stop at every table, so it does take a while. 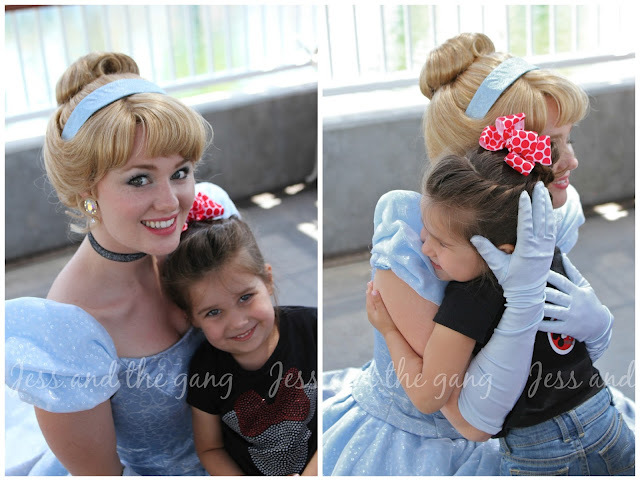 And Isla asked each one when Cinderella was coming, which is her favorite princess. 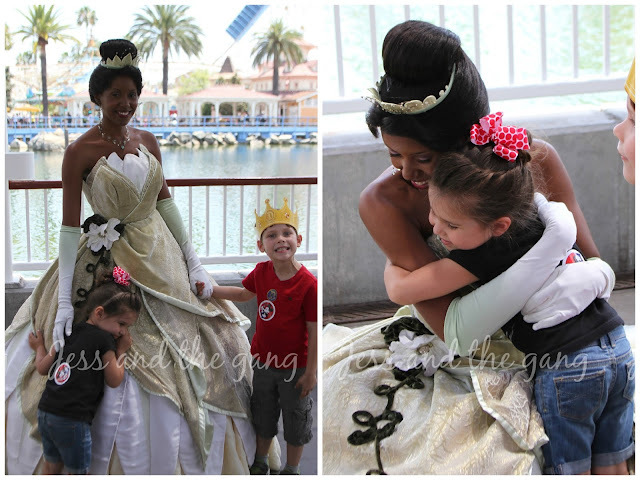 Even though Cinderella is her favorite, I have to give props to Tiana because she was definitely the most interactive. She got down on the ground and talked with Isla for a couple minutes. Not to mention that her dress looked really cool all spread around her on the ground. Isla was very excited about Cinderella and she didn't disappoint. And Cinderella asked Connor if he would be interested in marrying one of her stepsisters. Cinderella did a great job of staying in character and talking with the kids about the various characters in the movie, like Jack, Gus and Lucifer. After lunch, we went and rode a few rides. Then we went to the Frozen Sing-a-long, which was everything I hoped it would be. They had a lot of humor in it for the adults. The lighting was amazing and with lights they kind of built Elsa's ice castle around you. Then, at the end, it snowed. Isla had such a huge smile on her face. It was fun. She actually asked to go watch it again. On our way to Car's Land, we stumbled upon Jake and the kids of course said hi. 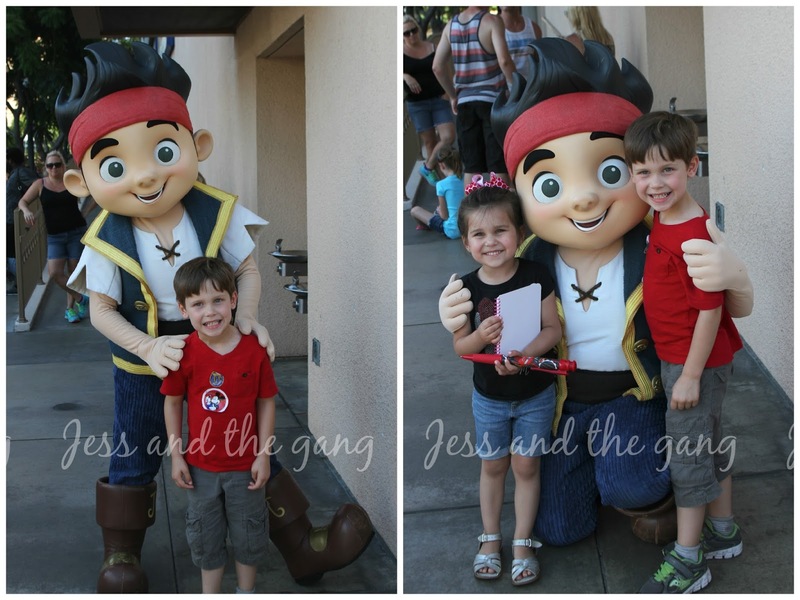 They are both huge Jake and the Neverland Pirates fans. Everyone else got to go on the Radiator Springs Racers, but the ride wasn't suitable for either Isla or I. So we headed back to A Bugs Land for a couple rides. The other nice thing about bugs land is the lines are almost nonexistent, so you can get in a couple rides really quickly. 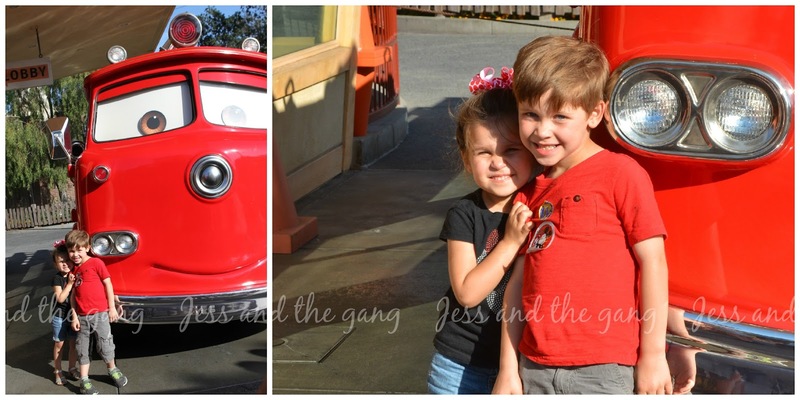 We went on three rides and walked back to Car's Land and still beat everyone…and they had fast passes for their ride! 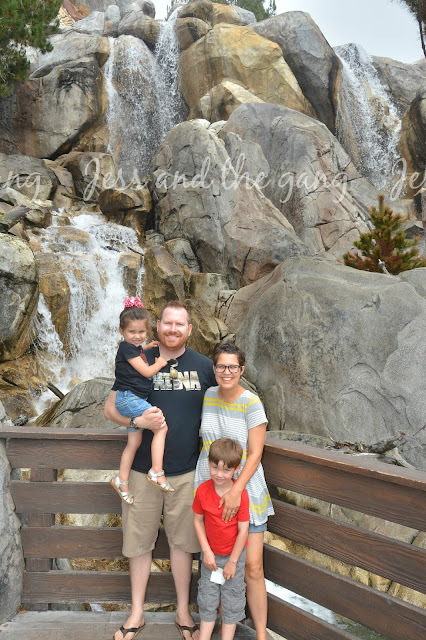 After Cars Land, we went over to Paradise Pier and rode a few rides. Then, Ian, the kids and I decided to head home about 7:30pm. I could tell the kids were tired (judging by their short fuses) and with knowing we had our breakfast with Mickey the next morning, I wanted them to get some sleep. All four of us were fast asleep by the time the rest of Ian's family came home. Oooooh! So fun!!! Ariel's grotto seems a lot like CInderella's Royal Table where we ate at Magic Kingdom. Except we had to do Tiana separately. Taylor would have loved to have met her at a meal. The Frozen sing a long sounds exactly like the one in Hollywood studios too!